For younger fans, you probably don't remember the days of wrestling when there wasn't a general manager coming out during each show and putting matches together on the fly. It's been a standard now in the WWE for years now. Back in the 1980's and early 90's, there was one man who ruled the WWF from his office in Connecticut. That man was former Canadian promoter Jack Tunney. He was the "president" of the WWF for about a decade. The cool thing about Jack Tunney back then was that he rarely was on TV. Not like today when we see Vickie Guerrero, Teddy Long, or a lap top computer making interruptions on a constant basis. Sometimes the GM becomes the focus of the show, which takes away from the rest of the program. Tunney did make some big "decisions" in his time in office. He suspended Andre the Giant back in the late 80's. With Andre gone, the WWF was able to sign the elusive Giant Machine from Japan. He was really cool. In 1988, he stripped Ted DiBiase of the world title after Andre won it and surrendered it to the Million Dollar Man. I remember the decision Tunney rendered that made me scratch my head the most was when he declared that there would be no rematch between Hulk Hogan and the Ultimate Warrior. (Warrior had pinned Hogan for the world title at Wrestlemania VI) I don't remember the exact wording, but it was something about there being too much risk of getting hurt. Umm, isn't it wrestling? I know, I know it was all just a storyline, but that was pretty weak even for 1990. Tunney also chose Randy Savage as the number one contender to Ric Flair's world title at Wrestlemania VIII and declared Bret Hart and Lex Luger co winners of the 1994 Royal Rumble. He left the WWF shortly after that decision and was replaced by longtime commentator and former wrestler Gorilla Monsoon. Tunney disappeared from wrestling and passed away in 2004. He was 68 years old. The saddest thing I read about his death was that no one from WWE showed up at his funeral. Wow. So the next time you hear "Excuse me!" 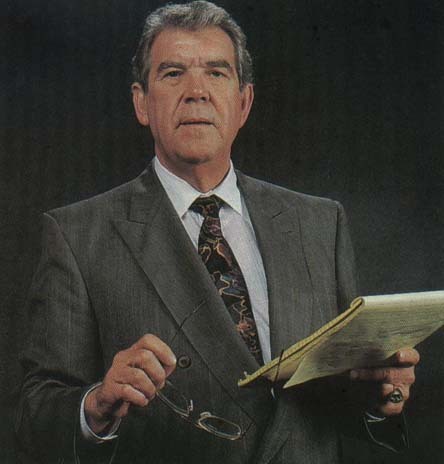 or "Pardon the interruption..." think of the man who helped lay the groundwork for the wrestling figurehead, Mr. Jack Tunney. Me and my cousin grew up on this stuff, I always got to be the guy he tried his new found moves on... ouch. I remember the decision Tunney rendered that made me scratch my head the most was when he declared that there would be no rematch between Hulk Hogan and the Ultimate Warrior. (Warrior had pinned Hogan for the world title at Wrestlemania VI) I don't remember the exact wording, but it was something about there being too much risk of getting hurt. He feared that the combined power of Hulkamania and Destrucity would be too much for the Earth to handle.